Delta Group, a global leader in power and thermal management solutions, together with its brand, Vivitek, today announced the debut of an industry-leading 4K DLP® Laser Video Wall Solution consisting of four UHD-4K cubes, the world’s brightest 4,000 lumen laser phosphor illumination source. 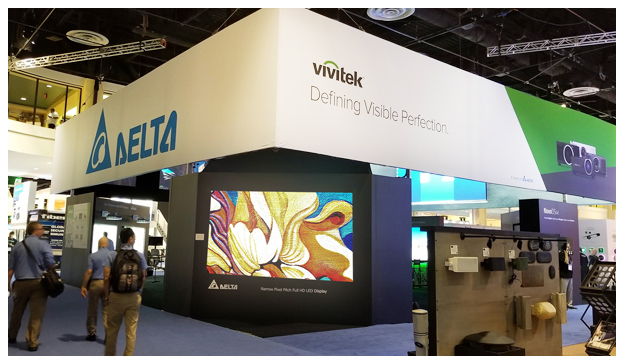 Delta also launched a series of innovative Vivitek large venue projectors, including the ultra-high brightness DU9800Z, and the latest Novo Connect Solutions. These cutting-edge technologies are available to demo at InfoComm 2017, booth number 4443, today through June 16. The newly introduced 4K DLP® Laser Video Wall Solution consists of true UHD-4K cubes (4K DLP® Laser Video Wall) paired with Delta’s DVCS® (Distributive Vision Control System). This platform, which can manage multiple video sources on a single display, enlarge a single video signal to multiple displays or enable centralized control of several video walls, creates an unparalleled reliable, flexible and scalable display solution capable of fulfilling critical applications, such as surveillance, disaster control and traffic supervision. 4K DLP® Laser Video Wall - This state-of-the-art solution, which utilizes four industry-leading 4K-resolution laser cubes with 560mm-depth extra slim form factor, features unmatched 4K (3840 x 2160) resolution, and an unmatched 4,000 lumen laser phosphor illumination source, a brightness uniformity greater than 95 percent of its 70-inch cubes. Its built-in Intelli-Sense functions monitor the various parameters of the system and automatically perform real-time adjustments for 24x7 operations. This superior video wall is also the first within the industry to offer IP6X protection rating and an optical sealed engine for up to 100,000 hours of worry-free operation. DVCS® (Distributive Vision Control System) – A high-performance IP-based control system designed to fulfill the sophisticated needs of control room applications, while ensuring perfect continuity of images across multiple cubes. The brand new DVCS® Gen. 3 is capable of handling 4K resolution input and output with 60 frames per second (fps) performance. It can directly support H.264 and H.265 IP streams decoding, as well as PoE and IP KVM functionality. The new Vivitek large venue projectors feature brightness levels ranging from 5,500 to 18,000 ANSI lumens and contrast ratios as high as 20,000:1. This series of projectors can meet the needs of any large venue application with resolution options of WUXGA and UHD-4K, edge-blending and warping features, and a full range of optical lenses, depending on the model. These Vivitek projectors can achieve a HDBaseT digital transmission (audio and video) over 100m of Cat6 LAN cable. Some models also able to reach this standard using 3G-SDI coax cable over 100m, which is used in rental, staging and broadcasting applications. DU9800Z – Delivers 18,000 ANSI lumens, a 10,000:1 contrast ratio and an environmentally-friendly lampless design. The DU9800Z incorporates DLP® DarkChip3TM and BrilliantColorTM technologies, an advanced video processor for fluid video streaming and a complete range of motorized interchangeable lenses, ranging from 0:84 to 7:01 throw ratio. DK8500Z – Achieves true UHD-4K resolution, 7,500 ANSI lumens, a 10,000:1 contrast ratio, embedded edge blending and custom warp, eight optional lens options, and supports 360-degree landscape and portrait mode projection, as well as vertical & horizontal lens shift. DU6690Z – Provides 6,500 ANSI lumens, a contrast ratio of 10,000:1, eight optical lenses ranging from 0.38 to 8.26:1 and a Lens Position Memory (LPM) feature, allowing users to easily save lens presets for focus, zoom and lens shift. HK2288 – Brings true UHD-4K resolution, 2,000 ANSI lumens, a 50,000:1 contrast ratio, REC.709 color space for accurate color reproduction, high performance scaling and programmable 12-bit gamma for RGB, and a HDR10 High Dynamic Range to home cinema settings. Additional features include 1.5x wide zoom and vertical lens shift for flexible installation. Vivitek’s new NovoConnect solutions, which include NovoEnterprise, NovoTouch, and NovoDS4K, spark the next generation of wireless collaboration technologies. NovoDS4K – Designed for creating on-the-spot content for instantaneous signage, the Ultra HD 4K digital solution enables users to generate true-4K digital signage content through easy-to-use software features without the need for any programming. Vivitek, a brand of Delta, manufactures an extensive line of visual display and presentation products. Vivitek’s line of digital projection and display products incorporates the latest innovations and technologies to meet the market demands for education, business, home theater and large venue. Delta, founded in 1971, is a global leader in power and thermal management solutions and a major player in several product segments such as industrial automation, displays, and networking. Its mission statement, “To provide innovative, clean and energy-efficient solutions for a better tomorrow,” focuses on addressing key environmental issues such as global climate change. As an energy-saving solutions provider with core competencies in power electronics and innovative research and development, Delta's business categories include Power Electronics, Automation, and Infrastructure. Delta has 153 sales offices, 61 R&D centers and 40 manufacturing facilities worldwide.